I often talk to groups of new personal trainers, just making their way into the Fitness Industry. 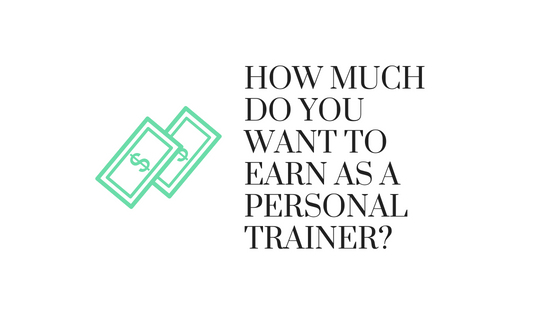 One of the most common questions I get asked about is potential earnings as a personal trainer in the UK. This is a difficult one as so much is an individual thing that is highly dependent on your client base (or niche), your location and also your experience. I hear so much of the time two opposing view points when it comes to the potential earning potential of personal trainers. On one hand you have some fitness marketing gurus and some training companies spouting an easy six figure income as a fitness professional. This as I am sure you are all aware is not easy for a start and few personal trainers get to that level of income in their whole career. On the other hand we have the failed personal trainers, those that say that the industry is flooded with personal trainers and their is no longer a market. Now the marketing is more challenging than years gone by, there are more trainers than there used to be and this does have an effect on prices. But at the same time there is a much larger public interest in fitness, so this has lead to a massive increase in potential clients. I am somewhere in the middle, I believe that it is possible to make a very good living from the fitness industry, and everyones good is different but with hard work and a bit of business support you can make a decent living. In terms of my view as to if the market is saturated then this would be a long one and a post that I will one day get round to getting up on the internet. So the first step in the how much do you want to earn is to estimate what you would like to have as a salary? Have a realistic think about the amount of income that would keep you happy, cover all your outgoings and leave enough for a bit of fun! So lets say this is £30,000 (obviously you would have to look after the tax out of that). So then my next step is to think through what I have in terms of allowable business expenses, so things like my mobile phone, marketing, uniforms, etc… Lets say that works out to be an average of £300 per month, that equates to £3.600 per year. If we add all this together that means that I would need to earn £33,600 to pay yourself your perfect wage and take care of all those bill thingies! Now for some of you that will sound like a difficult number to achieve, especially if you are new to self-employment and the sales aspect of being a personal trainer. But what might help is to break this down a bit so you can see how many potential clients you need at what kind of price. Now for this bit you will need an idea of the kind of price you are looking to charge per hour, so if I have done some research on other trainers in my area. If i have looked at where I sit compared to them on price and level of service, if my service was a home based trainer and in my area prices per hour level out £45 per session, but if I average that out at £40 based on the fact that i am going to do some discounting based on block bookings. So simple maths £33,600 divided by £40 gives me 840 sessions that i need to conduct a year to achieve this. If I decide I will work 48 weeks a year (as we all nee some down time), that means I need to be doing on average 18 sessions per week. As a personal trainer it is so important that you have a strong understanding of your pricing, costs and therefore you can set yourself realistic targets for earnings. So have a go at the above an set yourself some weekly targets that will get you to your desired earning level! As usual any questions please do comment below.